Stock photo of Mary's Harbour wharf with fishing boats, Highway 510, Labrador Coastal Drive, seen from the Battle Harbour Ferry, St Lewis Inlet, Viking Trail, Trails to the Vikings, Southern Labrador, Labrador, Canada. Colorful fishing boats sit at Mary's Harbour wharf, Highway 510, Labrador Coastal Drive. 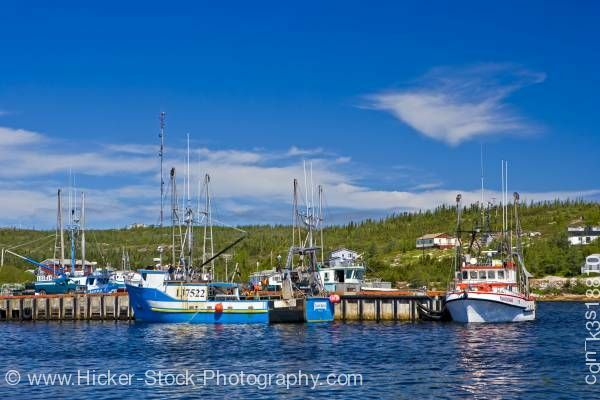 This stock photo shows Mary's Harbour wharf with fishing boats, Highway 510, Labrador Coastal Drive, seen from the Battle Harbour Ferry, St Lewis Inlet, Viking Trail, Trails to the Vikings, Southern Labrador, Labrador, Canada. A beautiful sunny day at the Mary’s Harbour wharf has colorful fishing boats sitting along the docks. A bright blue boat with white trim sits at the front of the wharf and another boat, white with red trim sits waiting on the right. Sitting along the wharf you can see the crane’s tall poles towering over the boats, along with a blue pick up truck. In the background, a few homes sit among the green trees on the vast hillside. The beautiful blue sky with a soft wisp of white clouds adds to the background. Mary's Harbour wharf with fishing boats, Highway 510, Labrador Coastal Drive, seen from the Battle Harbour Ferry, St Lewis Inlet, Viking Trail, Trails to the Vikings, Southern Labrador, Labrador, Canada.